KOTA KINABALU (Feb 7): Gamuda Land aims to launch the third and final tower of Bukit Bantayan Residences phase 1 in Kota Kinabalu, Sabah, in March. A unique highland retreat-inspired residential development and situated on an 18.2-acre leasehold parcel on Inamam, Bukit Bantayan Residences is the maiden development by Gamuda Land in Kota Kinabalu, boasting views of the South China Sea and Inamam’s mountains. The overall GDV of the project is about RM996 million. Phase 1 of the development comprises three towers — Ebena, Cemara and Dilenia — featuring 912 three-bedroom and dual-key condo units altogether. Both Ebena and Cemara were launched in 2016 and 2017 respectively, and have achieved take-up rates of 85% and 70%, according to Gamuda Land chief executive officer Ngan Chee Meng. The last tower to be launched in March 2018 will be Dilenia, comprising 320 homes in a 27-storey tower. Built-ups will be between 904 sq ft and 1,100 sq ft, while prices will start from RM493,800. All homes will come with two car parking bays. “As a town-maker, Gamuda Land creates places that people will call home, want to be a part of, grow up and grow old in. “Our dedication to good town-making is underscored by our strong focus on the elements of thoughtful mater-planning, innovative placemaking and sustainable community building and all our developments are built using similar development principles,” said Ngan in his speech at the Ebena tower topping up ceremony today. 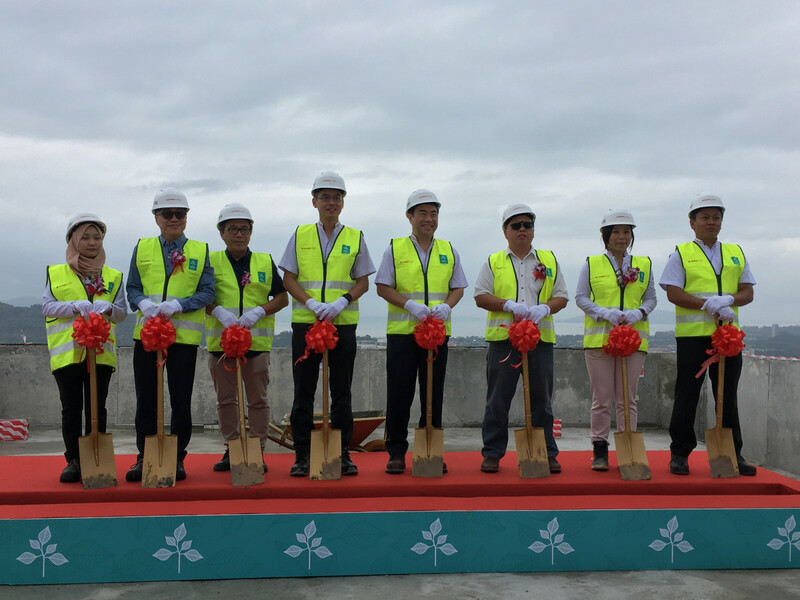 The topping up ceremony marks a milestone for Gamuda Land as construction has reached the rooftop of Ebena tower, which is slated for completion in 2019. “To give our developments a personality that people can resonate with, we think of every aspect from planning and architectural design of Bukit Bantayan Residences to mindfully planning the layout to capitalise on the stunning South China Sea and Inamam mountain views. “We also thoughtfully place a Village Square amidst the facilities podium where the community can truly get to know their neighbours because we understand that the common ground for any successful development is the community,” Ngan added. Bukit Bantayan Residences will also comprise 25 retail units in Village Square, providing residents doorstep lifestyle convenience. The retail units are for lease and managed by the developer. Located on a hill side, Bukit Bantayan Residences sports an earthquake-resistant structure that is able to withstand up to 7.0 Richter seismic magnitude scale from the Ranau epicentre. Facilities of the development include reflexology path, children’s playground, 50m infinity pool, green canopy walk, multipurpose court and gymnasium. On Gamuda Land’s first venture into Borneo, Ngan said the take-up rate of Bukit Bantayan Residences speaks volumes for the developer. “We will look to be at Kota Kinabalu for the years to come. I see a potential growth in Sabah, especially with the upcoming Pan-Borneo Highway,” he said told reporters at a media conference. Meanwhile, Bukit Bantayan Residences general manager Cheo Yuan Ping said the majority of the homebuyers are local Sabahans originating from Kota Kinabalu, Sandakan and Tawau. “Phase 2 and 3 will be something different,” he said without elaborating. Bukit Bantayan Residences is accessible via Jalan Bantayan Minintod and is 3km and 12km away from Inamam and Kota Kinabalu. Other vertical developments by Gamuda Land include The Robertson in Kuala Lumpur city centre, HighPark Suites in Kelana Jaya as well as 661 Chapel St. in Melbourne, Australia which will be completed by 2Q2018 and GEM Residences in Toa Payoh, Singapore.